A Benedictine abbey, the Church of San Pietro was founded in the 10th century on the Monte Calvario. It functioned as the cathedral of Perugia in the 6th century (located outside the town walls at that time), prior to the status of cathedral being given to Santo Stefano in Castellare (demolished during the construction of the abbey and church of San Domenico) around 936 and then finally to San Lorenzo, the actual cathedral. Angry citizens burnt the abbey after Francesco Guidalotti in 1398 plotted against the leader of the People’s Party, after which there followed a period of decline in its fortunes. 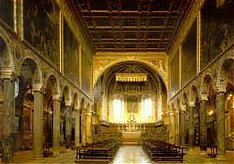 As demonstrated by the existing buildings and interiors, however, the abbey recovered considerable prosperity under the rule of Pope Eugene IV. The triple-arched portal at the entrance to the main court reflects Porta di San Pietro, which is visible from here. 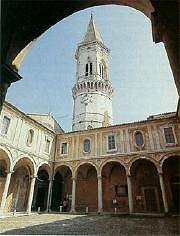 It was built in 1614 to a design by Valentino Martelli, who had also designed the main cloister and a second foor that was never built. The minor cloister (or 'delle Stelle'), was instead designed by Galeazzo Alessi in 1571. The main court is dominated by the polygonal clock-tower, allegedly built on the site of an Etruscan tomb that was used for its construction in the 13th century. After a partial collapse, the upper section was rebuilt in 1463 to plans by Bernardo Rossellino. The original Romanesque blind arches on the facade of the church have been restored (see the paintings by Bonfigli in the Galleria Nazionale). There are also frescoes by local painters from the 14th century, while the portal dates back to the late 15th century. The interior is a mixture of ancient columns and has a Palaeochristian basilical structure. The Gothic wooden choir is considered to be one of the finest in Italy and was completed between 1525 and 1591). The painted and guilded wooden lacunar ceiling is from 1556, while the large quantity of frescos and paintings by various artists include some by Antonio Vassillacchi (1592-94), Sassoferrato, Guido Reni, Vasari, Guerricino and Perugino (Pietro Vannucci). The sacristy was added in 1451 and contains inlaid furniture from 1472, as well as what remains of a pavement in Deruta tiles. The frescoes are by Danti and Peccenini. The paintings hanging here are by Perugino, Parmigianino and Raphael. A door in the apse of the wooden choir leeds to a tiny balcony that affords a stunning view over the Valle Umbra as far as Assisi, Monte Subasio, Bettona, Montefalco and the Apennines. The buildings of the abbey around the two cloisters now house the Agriculture Faculty of the University of Perugia, which also owns the abbey's former properties in Casalina, in the Tiber valley.